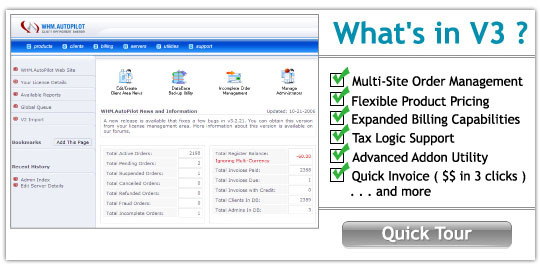 WHMAutopilot is a billing system that was built specifically for the web hosting industry. WHMAutoPilot have a complete web host management system that includes a feature rich product profile system, billing management and customer support system. It also has the ability to create 'remote' order systems so that one installation can manage multiple host websites/reseller accounts/servers, with their own identities and branding, managed by a single admin area installation. WHM Autopilot's built-in hands free system be programmed to process orders and activate new hosting accounts, suspend/unsuspend accounts, send invoice notifications and past-due notices and many more, so the host can spend more time generating business instead of chasing existing clients. WHM Auto Pilot is sold for $19.95 a month. WHM Autopilot's is provided 100% FREE with our selected reseller plans. If your clients have any questions or problems they are able to open up a support ticket from within the built in help desk. Note: Please contact the Billing Department for your FREE WHMAutopilot license.